A cocktail making hen party has been a favourite choice for years, but why not have all of the perks of normal cocktail making in the comfort of your own venue? This Edinburgh mobile cocktail making hen party is the perfect way to celebrate as a bride to be, whether you want to be in a hotel, a holiday cottage or even your own home! Cocktail making is the chance to drink, laugh and chat with friends and family on your special day, as well as creating a couple of delicious drinks yourself! 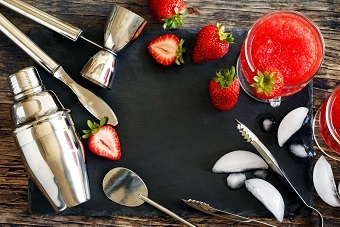 All of your hen group can get involved with this hen party experience and mix, shake and muddle some tasty cocktails with their favourite flavours. You’ll get a whole 2 hours to find the right flavours for you, learn some tips and tricks and get making some drinks. A professional bartender will come to the Edinburgh venue of your choice, as well as all the equipment needed to create a huge range of drinks. So if you fancy a classic Mojito or want to go crazy and make up a completely new drink, you'll have everything you need waiting. You’ll get the chance to experiment with flavours and garnishes on this hen party. When you’re finished creating 3-4 cocktails each, drink and enjoy them with the girls to really make your activity one to remember. You choose the time and our bartender’s will be there to show you the tricks of the trade and how to blend flavours together for an amazing hen party drink. This mobile cocktail making in Edinburgh is perfect as a unique experience on its own, or it can kick off a wild hen night out in the beautiful city – it’s totally up to you on your special day! If you’re looking for an activity in the historic city of Edinburgh that can be completely tailored to your needs, then our Edinburgh hen party ideas will be fab for you. Call us on 0161 341 0052 and let our events planners do all of the hard work for you, so you can relax and have a great time.